100, 1000, 10000 and more tasks are not a problem anymore. The rendering of tasks became much and much faster due to the mode that allows not to load all tasks at once but render them as far as they appear on the screen. Moreover, even if your project with gantt doesn’t contain thousand of tasks, the rendering time will be increased since 4.0 due to optimization of loading and rendering in general. Since dhtmlxGantt 4.0, all the actions made to gantt can be undone and redone. You may now make changes to your gantt without worry of how to return everything back. – Most used helpers, such as dhtmlxMessage, dhtmlxDataProcessor and dhtmlxAjax has been added to gantt namespace. – Legacy code has been removed from the component, as a result it no longer pollutes the global namespace with unnecessary variables and functions. 1) Gantt documentation becomes more complete and covers all aspects of work with dhtmlxGantt. 2) The component doesn’t have any API or CSS conflicts with dhtmlxSuite or dhtmlxScheduler libraries. 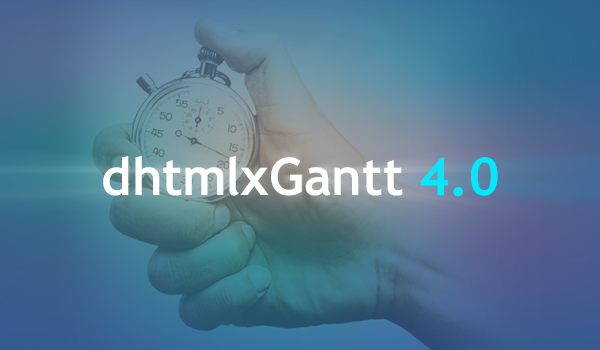 dhtmlxGantt 4.0 contains fallbacks for older API and is backward compatible with the code written for the previous versions. This means that most likely you won’t need to modify any of your existing code in order to update component, although we advise to make some changes for compatibility with the next major update (5.0). You may find the migration guide here. If you have any problems with migrations, feel free to open a ticket, submit your questions on forum or send us an email to support[at]dhtmlx.com. Full what’s new list with detailed description is available in our documentation. You can download Standard Edition of dhtmlxGantt here. PRO users will get the newsletter with the updated version soon.